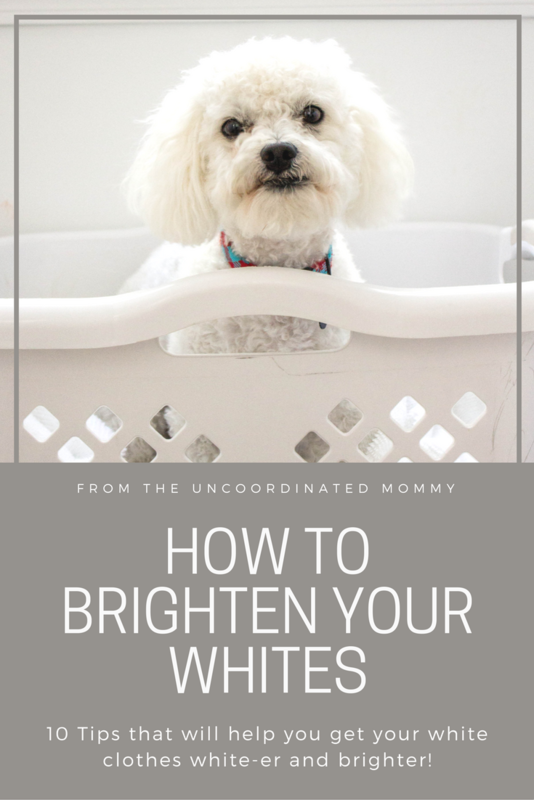 Laundry Tips: Washing Whites to Keep Them Bright! Need help washing your whites? 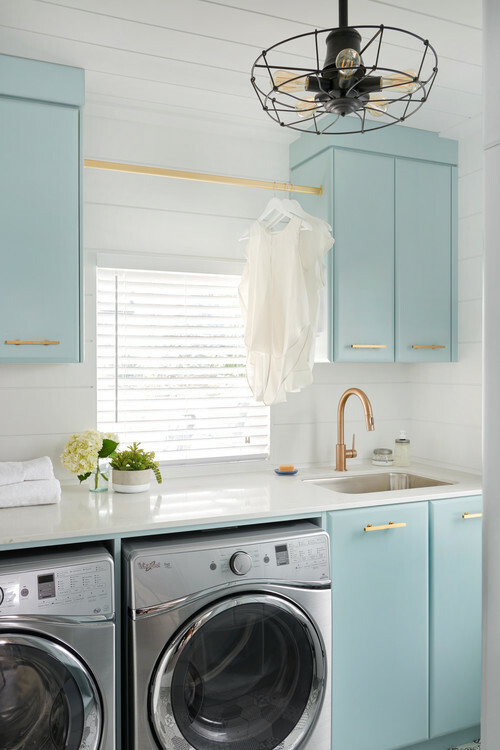 Check out these great tips to brighten your laundry days! We’ve all been there. We keep washing whites and then wondering why all of our white clothes look SO. DINGY. It’s awful. I love a crisp, clean, white look, and when I realized that my whites weren’t coming out so white anymore, I resolved to research the science of keeping your whites…well, white! Here are some tips and tricks to help restore your crown as the laundry queen! 1. Washing whites with whites. I know, this may seem COMPLETELY obvious. But if it doesn’t seem obvious to you, know this. Color transfer can happen even with cold water (although cold water does make it less likely). If you want to keep your whites white, keep them with the other whites! 2. Keep your loads small. The more clothes you have in your load, the more grime is released from the clothes. If your machine is too stuffed, the dirt has nowhere to go but back into the clothes, only more evenly distributed! 3. Use the right amount of laundry detergent. You might think that the more detergent you add, the cleaner your clothes will be. Not so. Too much detergent can leave stains and residue on your clothing. However, too little detergent won’t be as effective either. Follow the directions on the bottle/container to make sure you’re adding the right amount of detergent for the size and soil level of your loads. If you want to make it SUPER easy, try laundry pods for “portion controlled” detergent. 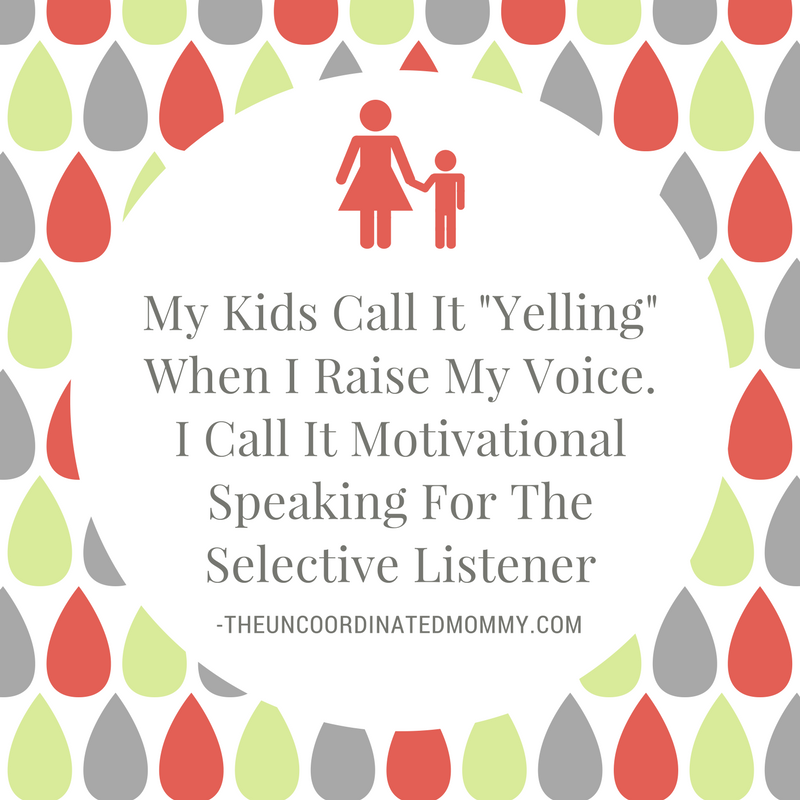 Bonus: this will also make it easier for your kids to do the laundry! Just remember to keep them out of reach for kids younger than 5 years old. They are too tempting to nibble on, definitely NOT a good thing. 4. Bleach does not necessarily equal white. You might not want to haul out your cleaning bleach for this one. Bleach can actually cause yellowing of garments. If you want to use bleach, use a non-chlorine bleach like Oxiclean. Also, NEVER use bleach on anything but 100% cotton clothing. 5. Attack your stains right away! If you’ve got a stain on your white clothing, the sooner you rinse and spray it with a stain-removal spray, the more likely it is that it’ll come out. 6. Soak your stains for lasting results. Stained your best white shirt? For the best results (and this includes yellow armpit stains), you’ll want to soak it for 30 minutes before washing in the hottest water temperature recommended on the label (along with Oxiclean). 7. Vinegar is your friend. I love vinegar for all of its cleaning properties, but did you know that a cup of distilled vinegar added to a whites wash will brighten up your whites? Turn your clothes inside out, as the friction in a washing machine can degrade the fibers of the clothing. Unless your kids have really done a number on them, then you need to leave them right side out to get to the dirt. 9. If your whites are dingy, try a soaking! Soak them for a few hours or overnight in a mixture of cool water and Oxiclean. Then drain and wash as normal. Repeat this as necessary. 10. Dry whites outside when possible. Dryer=stains forever. The sun will act as a natural bleach. You can actually get rid of stubborn stains this way. If a stain remains on your garment after treating and washing it, DO NOT dry it in the dryer as that will set the stain! Dry it in the sun with the stain facing up. If it’s still there after a day, re-treat it and wash again. 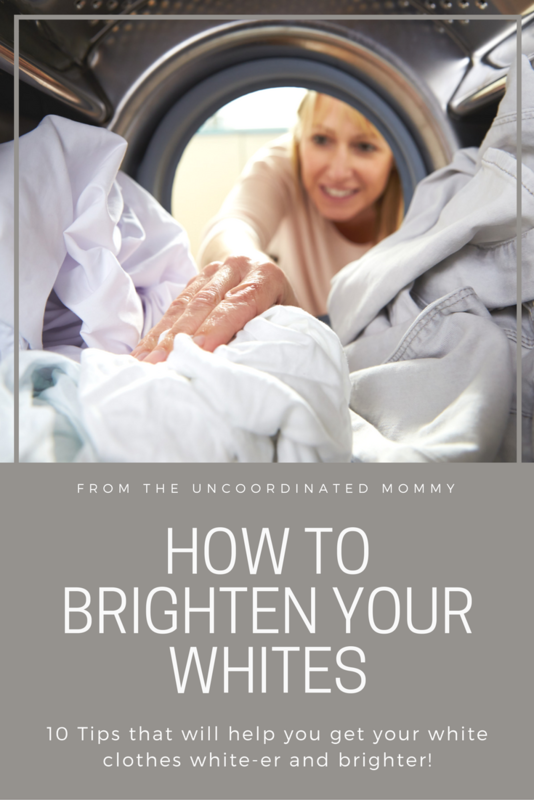 I hope all of these laundry tips will help you with keep your whites looking white! Now, unfortunately I haven’t actually figured out how to keep Chase looking bright white yet. Too bad he didn’t come with a little laundry tag! !